Lake Natron is a salt or soda lake in Arusha Region in Tanzania. It is in the Gregory Rift, which is the eastern branch of the East African Rift. The lake is within the Lake Natron Basin, a Ramsar Site wetland of international significance. The southern half of Lake Natron (top). Fault scarps and the Gelai Volcano can also be seen. Numerous near-white salt-crust "rafts" pepper the shallowest parts of the lake (inset). The lake is fed principally by the Southern Ewaso Ng'iro River, which rises in central Kenya, and by mineral-rich hot springs. It is quite shallow, less than three metres (9.8 ft) deep, and varies in width depending on its water level. The lake is a maximum of 57 kilometres (35 mi) long and 22 kilometres (14 mi) wide. The surrounding area receives irregular seasonal rainfall, mainly between December and May totalling 800 millimetres (31 in) per year. Temperatures at the lake are frequently above 40 °C (104 °F). The color of the lake is characteristic of those where very high evaporation rates occur. As water evaporates during the dry season, salinity levels increase to the point that salt-loving microorganisms begin to thrive. Such halophile organisms include some cyanobacteria that make their own food with photosynthesis as plants do. The red accessory photosynthesizing pigment in the cyanobacteria produces the deep reds of the open water of the lake and the orange colors of the shallow parts of the lake. The alkali salt crust on the surface of the lake is also often colored red or pink by the salt-loving microorganisms that live there. Salt marshes and freshwater wetlands around the edges of the lake do support a variety of plants. Most animals find the lake's high temperature (up to 60 °C) and its high and variable salt content inhospitable. Nonetheless, Lake Natron is home to some endemic algae, invertebrates, and birds. In the slightly less salty water around its margins, some fish can also survive. The lake is the only regular breeding area in East Africa for the 2.5 million lesser flamingoes, whose status of "near threatened" results from their dependence on this one location. When salinity increases, so do cyanobacteria, and the lake can also support more nests. These flamingoes, the single large flock in East Africa, gather along nearby saline lakes to feed on Spirulina (a blue-green algae with red pigments). Lake Natron is a safe breeding location because its caustic environment is a barrier against predators trying to reach their nests on seasonally forming evaporite islands. Greater flamingoes also breed on the mud flats. The lake has inspired the nature documentary The Crimson Wing: Mystery of the Flamingos by Disneynature, for its close relationship with the Lesser flamingoes as their only regular breeding area. Two endemic fish species, the alkaline tilapias Alcolapia latilabris and A. ndalalani, also thrive in the waters at the edges of the hot spring inlets. A. alcalica is also present in the lake, but is not endemic. The area around the salt lake is not inhabited but there is some herding and some seasonal cultivation. Threats to the salinity balance from increased siltation influxes will come from more projected logging in Natron watersheds and a planned hydroelectric power plant on the Ewaso Ng'iro across the border in Kenya. Although development plans include construction of a dike at the north end of the lake to contain the freshwater, the threat of dilution to this breeding ground may still be serious. There is no formal protection. A new threat to Lake Natron is the proposed development of a soda ash plant on its shores. The plant would pump water from the lake and extract the sodium carbonate to convert to washing powder for export. Accompanying the plant would be housing for over 1000 workers, and a coal-fired power station to provide energy for the plant complex. In addition, there is a possibility the developers may introduce a hybrid brine shrimp to increase the efficiency of extraction. According to Chris Magin, the RSPB's international officer for Africa, "The chance of the lesser flamingoes continuing to breed in the face of such mayhem are next to zero. This development will leave lesser flamingoes in East Africa facing extinction". Seventy-five percent of the world's lesser flamingoes are born on Lake Natron. Currently a group of more than fifty East African conservation and environmental institutions are running a worldwide campaign to stop the planned construction of the soda ash factory by Tata Chemicals Ltd of Mumbai, India and National Development Corporation of Tanzania. The group working under the umbrella name Lake Natron Consultative Group is being co-ordinated by Ken Mwathe, Conservation Programme Manager at BirdLife International's Africa Secretariat. As per communication on June 2008, Tata Chemicals shall not proceed with the Natron Project and further re-examination of this project will be subject to the Ramsar Wetlands plan, which is currently under preparation. Because of its unique biodiversity, Tanzania named the Lake Natron Basin to the Ramsar List of Wetlands of International Importance on 4 July 2001. The lake is also the World Wildlife Fund East African halophytics ecoregion. ^ a b c d e f "Eastern Africa: Northern Tanzania, on the border with Kenya". World Wildlife Fund. 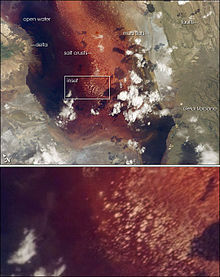 ^ "Lake Natron Basin". Ramsar Sites Information Service. Retrieved 25 April 2018. ^ Billock, Jennifer (14 June 2016). "The Deadly Lake Where 75 Percent of the World's Lesser Flamingoes Are Born". Smithsonian. Retrieved 17 June 2016. ^ "Position Statement on the Lake Natron Project" (PDF). Tata Chemicals. 13 June 2008. Archived from the original (PDF) on 5 October 2013. Retrieved 7 October 2013. Wikimedia Commons has media related to Lake Natron. "Lake Natron, Tanzania". Earth Observatory Newsroom. Archived from the original on 1 October 2006. Retrieved 17 April 2018. "East African halophytics". Terrestrial Ecoregions. World Wildlife Fund. This page was last edited on 24 March 2019, at 07:20 (UTC).